LAS VEGAS – South Korean carmaker Hyundai has revealed its concept for a car with robotic legs that could save lives as a first responder in natural disaster zones. Hyundai unveiled this walking car design, complete with robotic legs, that the company claims is the future of the first responder industry and has “limitless” purposes, CNBC reports. Inaugurated at the CES technology expo in Las Vegas, US on Monday, “Elevate” is designed for use at natural disaster sites, with users able to drive, walk, or climb over “the most treacherous terrain.” Currently in the early concept stages, there is no official timeline for its commercial roll-out. Hyundai has been working in partnership with Detroit firm Sundberg-Ferar on the concept for almost three years. 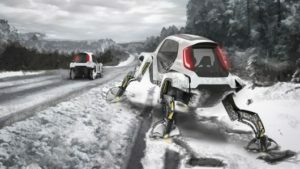 Elevate would be the first Ultimate Mobility Vehicle with moveable legs, and the first to combine technology found in both electric cars and robots. 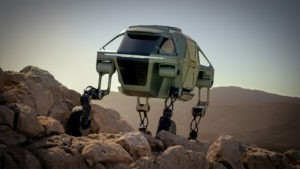 Capable of “both mammalian and reptilian walking gaits,” the vehicle can climb walls, step over large gaps and move in any direction – all while keeping its passengers level. Its legs are also retractable, providing a regular driving mode that reduces energy use and allows Elevate to be operated as a normal car. John Suh, vice president and head of Hyundai Cradle, observed that current rescue vehicles were only able to deliver first responders to the edge of a debris field, whereas Elevate can drive to the scene and climb right over flood debris or crumbled concrete. The design relies on Hyundai’s latest electric actuator technology, which grants the vehicle’s robotic leg architecture six degrees of freedom, meaning it has six independent aspects of motion. These are vertical hip, horizontal hip, knee, ankle, steering and wheel. Each wheel is also powered by a hub propulsion motor. With its wheels fully extended the vehicle can cross landscapes that even the most capable off-road vehicles would not be able to. Called “active suspension” this mode of driving causes the legs to follow the uneven terrain while keeping the car body level.